It was my 30th birthday this past weekend. And I spent the day laid up in bed recovering from another bout of extreme pregnancy pain that I endured the whole night before. My luck of course. So, our original plans to the city were cancelled. I slept all day. By evening I felt much better to at least head out for a dinner date with my honey and to finally stop by Chocopologie. While I was recovering, Seth took the kiddies to pick up a birthday cake. 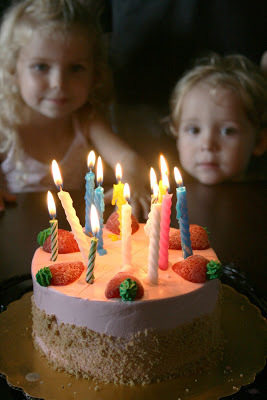 It was too cute–when they got home the kids raced into my room, pulled me out of bed, found all the remaining candles in the house (and there were only 12), put them on the cake, sang happy birthday, watched me blow out the candles and then devouted the cake. It was quite amusing watching them get so excited over a little cake. The post Hello 30! appeared first on Darling Darleen | A Lifestyle Design Blog .